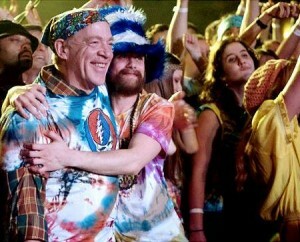 J.K. Simmons (l.) and Lou Taylor Pucci feel the ripple in The Music Never Stopped. After stealing so many shows, and not a few insurance commercials, J.K. Simmons (TV’s The Closer) finally gets to step into a lead role in this low-budget, independent film by first-time director Jim Kohlberg. Simmons lends his assured presence to this based-on-a-true-story movie, a medical-mystery mixed with family drama. The Music Never Stopped is based on the case study “The Last Hippie” from the book An Anthropologist On Mars, by Oliver Sachs, a remarkable exploration into a damaged psyche, akin to the higher-profile 1990 film Awakenings. Lou Taylor Pucci (Brotherhood) plays Gabriel, the adult son of Simmons and Cara Seymour (An Education), who turns up in a hospital after 20 years of estrangement with a massive brain tumor. He appears to be hopelessly brain damaged until Mom and Dad notice he’s his old self whenever a familiar rock song plays. Julia Ormond (Temple Grandin) portrays a professor who can perhaps help bring him back to normalcy. Pucci nails the vital central role, conveying the telling details of a brain damaged man in small gestures, not the least of which is making his eyes glaze over when the music stops. Simmons, well, he’s Simmons, and he uses his gift of being able to turn down his wattage so as to let others take center stage to good effect in this film. Kudos to Kohlberg and the rest of the filmmakers, who clearly knew the material was above par and gave it their best. This is a beautiful story, simply told. And since they don’t give trophies for the grunts who wangle the all-important music clearances, here’s a verbal award to those who managed to land the rights to the one of the best 1960s soundtracks we’ve heard since The Doors. Included are numbers by Dylan, Donovan, The Grateful Dead and Crosby, Stills & Nash. Director Kohlberg talks about the difficulties in getting the rights to the classic rock songs in his commentary on the DVD. But the best of the bonuses are interviews with Oliver Sachs. We just wish there was more of the original Gabriel and his dad, as their exposure is limited to a single photograph taken at a climactic Dead show.